Spain's Garbine Muguruza beat twice Wimbledon champion Petra Kvitova 6-4 4-6 7-5 to reach the semi-finals of the WTA Finals in Singapore. Muguruza, 22, topped her group with a 100% record to set up a last-four tie with Poland's Agnieszka Radwanska. Despite her defeat, Kvitova also went through thanks to a 6-4 6-3 victory by fellow Czech Lucie Safarova over Germany's Angelique Kerber. Kvitova, 25, will meet Russia's Maria Sharapova, 28, in the semi-finals. 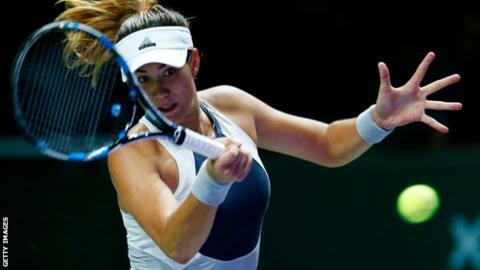 World number three Muguruza won her first meeting with Kvitova after five breaks of serve in the last set to continue her flawless run in her first appearance in the tour finals event. "You know to be here for me is a great pay-off after the whole year and hopefully I can continue winning and playing like this," said Muguruza, who lost to Serena Williams in this year's Wimbledon final. Safarova was unable to qualify but kept Kvitova's interest alive with her straight-sets win over Kerber, 27. Safarova, 28, said: "Teamwork! I'm happy for her that she went through to the semis. I'm happy for my win as well."